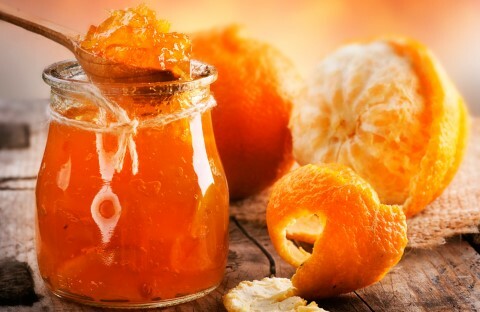 England has long been recognized as the source of some of the world’s best orange marmalade. Until recently, the bitter oranges the English used were grown in the public parks and streets of Sevilla. Picking oranges from the city’s orange trees was strictly forbidden, and fines were handed out to those who dared take the precious fruits. 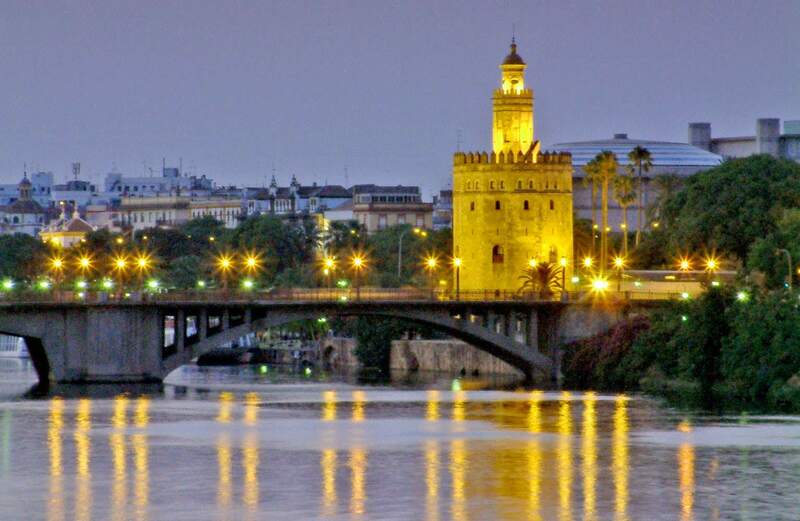 The entire harvest was shipped to England by virtue of a contract between the municipality of Sevilla and major English marmalade producers. Occasionally, an officer could be bribed to look the other way while five or six oranges were picked, which is just the amount needed to make this recipe. You will need bitter oranges, often labeled Seville oranges, for this recipe. Allow plenty of time to prepare the marmalade, as the fruit must soak overnight. Peel all the oranges and the lemon and cut the peels into fine julienne. Halve the fruits and remove the seeds. Place the seeds in a small bowl, cover with the hot water, and let stand for 24 hours. Cut each citrus half into quarters, place them in a large bowl, add the cold water, and let stand for 24 hours. Drain the seeds, reserving the water. Place the seeds on a square of cheesecloth, bring the corners together, and tie securely with kitchen string to form a pouch. Transfer the fruits and their soaking water to a large nonreactive pot, add the reserved soaking water from the seeds and the pouch of seeds, and place over high heat. Bring to a boil, decrease the heat to medium-low, and boil gently, stirring frequently, for about 3 hours, or until the fruit is very soft and the mixture looks like a purée. Remove and discard the seed pouch. Add the sugar a little at a time, stirring well after each addition. Continue to cook over medium-low heat, stirring frequently, for about 30 minutes, or until the mixture is very thick. At the same time, sterilize canning jars and two-part canning lids. To check whether the liquid is thick enough, drop a small spoonful of it onto a saucer, slip the saucer into the freezer for a few minutes, and then remove the saucer from the freezer and turn it upside down. If the liquid has set up and doesn’t fall from the saucer, the marmalade is ready. If it does fall, cook for a little longer and test again. Ladle the marmalade into the hot sterilized jars, leaving ¼-inch headspace. Using a damp cloth, wipe any spills from the jar rims and then attach the lids. To process in a hot-water bath, set the jars, not touching, on a rack in a large, wide kettle, add water to cover by 2 inches, bring the water to a boil, and boil for 15 minutes. (You may need to do this in batches.) Remove the jars with tongs and let cool to room temperature. Check the jars for a good seal; the lids should be slightly concave in the center. Store in a cool, dry, dark cupboard for up to year. If the seal is not good, or once the marmalade is opened, store in the refrigerator for up to several months.